Gabriele Angieri stars as the retired FBI profiler in the indie crime thriller, Profile of a Killer (review). 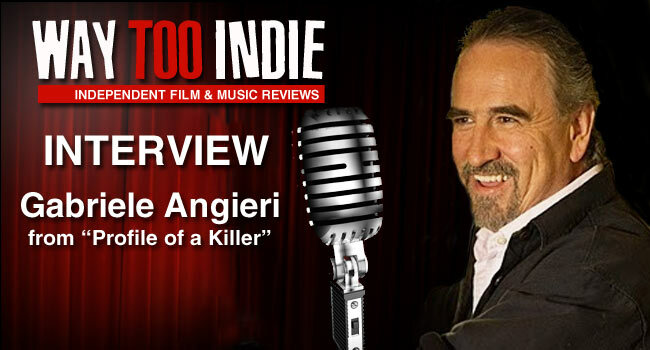 Angieri sat down with Way Too Indie to answer some questions about the film. He talks about how his theater experience helped him with his role, working in the cold Minnesota winter, and the effects of instant communication on our society. First off, can you give us a little background about your career as an actor? I have been acting since I was about 12 years old – a musical in junior high school and several in high school. I hold a degree in Theatre and Drama Lit from Queens College, City University of NY. I also had a private acting coach (William Jaeger) for about 18 months in my early 20’s. I did a couple of things in NY after college, but then started a family and didn’t act for about 23 years. Started again about 8 years ago in a production of Arthur Miller’s “The Price” at the Northfield Arts Guild, a community theatre about 35 miles south of the Twin Cities. Since then I have acted at several theatre’s around the Twin Cities including Theatre in the Round, Nimbus Theatre, Gremlin Theatre, Frank Theatre, Playwright’s Center and Park Square Theatre and a couple of short films. Where there any influences from your theater experience that transferred to this film? I think what you learn as a stage actor is to always be engaged and to actively listen. In film I think that becomes even more important since close ups take people within inches of your face. If you aren’t listening and engaged, it really shows. I think the process is very similar, but the mechanics of film force to you be very aware of how much you are moving. A tiny gesture can register on film – not so much on stage. Also, you never know what shots will be used by the director/editor, so staying engaged allows the filmmakers a lot more options when they get to the cutting room. I was surprised to find out that this was your first feature film given your excellent performance, what kind of preparations did you use to become a serial killer profiler? Well having a regular full-time job limited the amount of time I had to prepare, so shadowing a real profiler was kind of out of the question. We did have access to the local FBI and law enforcement so answers to technical questions were readily available. I did read a couple of books written by real profilers – pretty gruesome stuff about serial killers, their family histories (all the killers I had read about were abused as children) and victims–the sort of stuff that burns horrible image into your brain and makes it difficult to sleep at night. I also listened to a couple of books on tape to get a sense of the cadence and tone of these professionals. There was an evenness to the way they spoke that I believe was developed over time to hide emotion and to draw out the serial killers (once they were captured) into giving up details of the crimes and, many times, where to find victims that hadn’t been identified by the police. Given the relationship that develops between Saul and David I also relied heavily on my experience as a father of two sons (and five daughters). It is to my understanding that Samuel L. Jackson was originally arranged to play the role of Saul, which are large shoes to fill, can you tell us how you ended up playing the part? My wife cringes every time I tell the story, but my first audition had been scheduled toward the end of her pregnancy (of our now 3-1/2 year old). We went in for a pre-op visit for her C-section that was scheduled to happen two days later. Well, when we got there, they told us that based her condition they wanted to play it safe and would need to do the section 5pm that afternoon. My audition was a noon and I told her that I would really like to go to it, since I thought the part was a good fit for me and I didn’t want to miss the opportunity. It was a less than 20 minute drive and I could easily turn around if they decided to move things up. As you can imagine, she wasn’t too happy with me, but in the end agreed to let me go. I did a screen test that was sent to Caspian Tredwell Owen (the writer/director), got a call back and did three more in person auditions before landing the role. I am pretty sure every actor in town within ten years of my age had auditioned for the role, so I was pretty pumped to get the role. She has forgiven me since. Aside from one or two shots, the entire film was shot in Minnesota, how did that come about? It was originally scheduled to be shot in winter, in and around Detroit, MI, but when the original 12 million in financing fell through Caspian looked for a less expensive place to make the film. He had some connections in Minnesota that he had worked with in L.A.—plus there is a large professional pool of technical and creative talent in the Twin Cities – and we certainly have the bleak winter landscape that permeates the film and benefited from the Minnesota Snowbate Incentive program. It proved to be a good decision, since we received tremendous local support for the film, especially from local law enforcement, who allowed us to borrow a fully equipped SWAT Team for one of the scenes. We also were able to film in the Washington County Law Enforcement Center, State of Minnesota Highway headquarters, the local morgue and several other government buildings. How many days of shooting was involved with Profile of a Killer? Not exactly sure, but probably between 60 and 80 days total. The first scenes that were shot were between Joey Pollari and I and that took 22 days in December of 2009. There was another months of filming the next spring (2010) and then again the following year. The majority of the film relies on interactions between you and Joey Pollari. How much of your lines were rehearsed before shooting? We had a solid week of rehearsal that Caspian held with just Joey and I. It created a real foundation for our scenes together and allowed the shoot to go very well. Caspian really tried to create a cocoon for Joey and I to film in which made it easier to get ready for each scene. I remember that we ended up shooting about 6 pages in one day, which is pretty much unprecedented for a feature film. Are there any interesting facts you can share about being on set that a viewer would not know from just watching the film? The average temperature in that first December that we filmed was about 15 degrees, so the breath you see is our own. The dairy farm was really an abandoned dairy farm with all the rusted equipment included. The shackles that I wore got extremely cold during the shoot and we had someone trying to keep them warm between shots (they didn’t stay warm for long in that cold, but I really appreciated that person). My favorite shot in Profile of a Killer is when you are huddled up in a corner looking up with an almost halo like lighting around your head. In the Bible, King Saul had a son-in-law named David. In the film, David’s character had religious artwork in his room and seemed to go out of his way to celebrate Christmas. Your character played almost like a father figure to David, do you think some of the subtle religious themes were done on purpose? I would have to say yes. There is the obvious David and Goliath theme of the plot, but the subtle use of lighting, costume and scenery certainly evoke that feeling. Profile of a Killer at large seems to be about discovering one’s own identity, the fact that the film revolves around an FBI profiler serves as a great play on that. Given that social media certainly had a lot to do with the film, can you talk about what the relevancy of social media is to the film? I think that Andy Warhol was right on – it is the future and we all can have that 15 minutes of fame—but making a more lasting mark is still elusive to most. Our lives today are filled with more communication than ever, but I would argue that it doesn’t create greater personal connection with other people. You play video games with people you never see; send emails to people you never meet; even have initial dates with others without knowing much about them – we are numbed by gratuitous violence (there are many games in which you are the killer in all sorts of scenarios) in all our entertainment media. We really don’t know the full effects of that yet. I think that Caspian has created a scenario where this is brought to the next logical step – what are our children becoming? This is especially true of kids trying to grow up in this world. This is really a coming of age film where decisions about becoming an adult are twisted and perverted by the world we are creating. Given the barrage of what our commercial society is feeding our kids, what happens to David isn’t really that unrealistic.